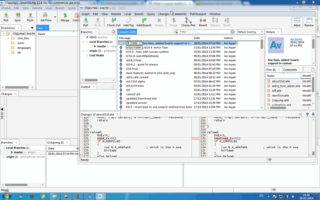 What is a good newbie-friendly graphical Git client for Windows? Personally I'd just install Cygwin and proceed with the usual *nix shell tools, but I need to make a software recommendation to some clients that need something a bit more newbie friendly. The situation is that several clients have developed website(s) of the mostly static HTML sort, but the server they need deploy to doesn't have your usual collection of 1990s protocols available (for example, no FTP). In fact, there is no access at all to the front end server. Deployment is handled through Git. Changes need to be pushed to a a remote repository that is accessible only via SSH key login. Any commits to the master branch pushed by the authorized key trigger a hook script that deploys the site to the production servers. …one or more local repositories. …authentication using an RSA key pair (generation of this would be a bonus). 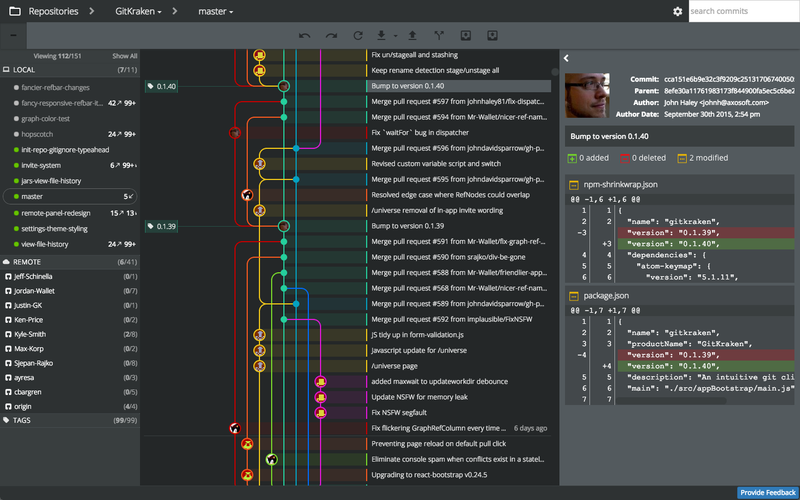 has a simple interface where a basic workflow of committing and pushing is easy to accomplish without understanding the intricacies of distributed version control. There it a GitLab instance available for each client that has one project per domain and makes adding their public key fairly easy. It also gives the clone/remote URLs for each project and makes it fairly easy to check what the status of the remote repository is. Open source would be preferred, but any reputable freeware would be acceptable. What client software should I point them to? Edit: Most suggestions to date seem to focus on full blown front ends to all of Git's functionality. I'm looking for something more pared down that only covers the basics and is better suited for a specific task than at running with the big dogs. I'm thinking the KISS principle here for people that do not use version control for anything else and just want to "upload" their websites. There is nothing like TortoiseGit for beginners. Very easy to setup and use. If you have experience with any git clients before, you won't take a minute getting on business. Simple Clean UI. 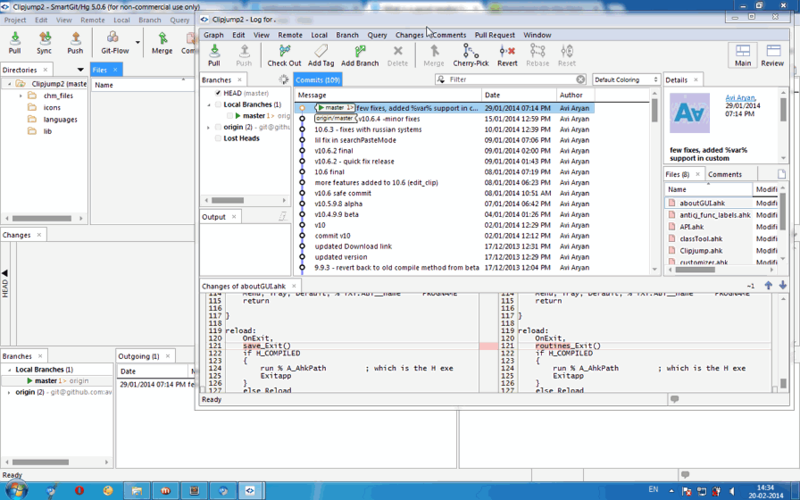 The main interface only shows the changed files and the big Commit, Merge, Push and Pull buttons. Commercial software but free for private use. For git beginners or non-git users, the only pain will be setting up the SSH keys. Once you have done that and cloned your first repository, it will be straight-forward and you will never have to open the console. 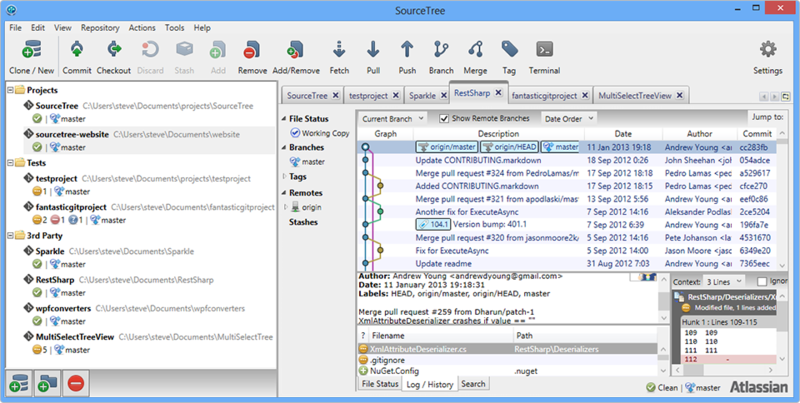 I am using Atlassian SourceTree and like it a lot. Bottom line - I find it almost perfect and use it for all the needs not covered inside my IDE. 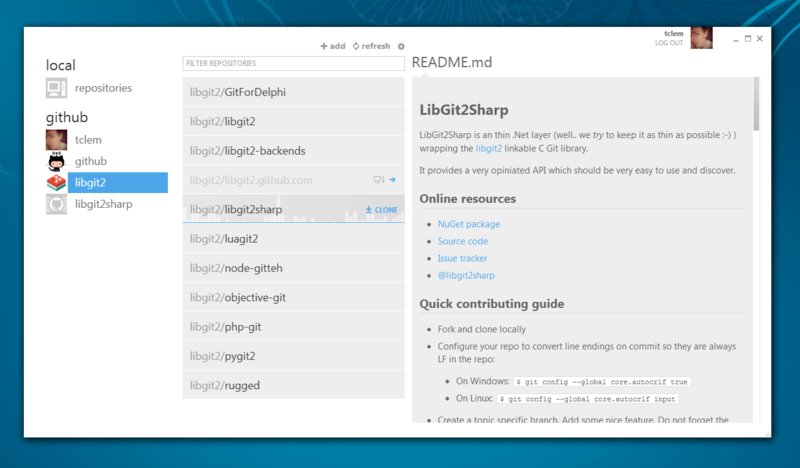 I very much like Git for Windows (msysGit). It has three 'modes' - Bash (where you can do everything), Windows Context Menu, and GUI (where you can do a lot less but it is I would say very user friendly). one or more local repos: Initialization is very simple and you can have as many as you want with no conflicts. has a simple interface where a basic workflow of committing and pushing is easy to accomplish without understanding the intricacies of distributed version control: Yes, see screenshot, it was much easier to learn for me when I first started playing with code than RapidSVN or TortoiseSVN. From the cmdline you can do EVERYTHING (pretty much); the GUI does have quite a few features but nothing complicated is shown on the front screen (only commit related), everything else is hidden in the menus. But there is one caveat: using with non-github repositories isn't intuitive (feels like a hack TBH). 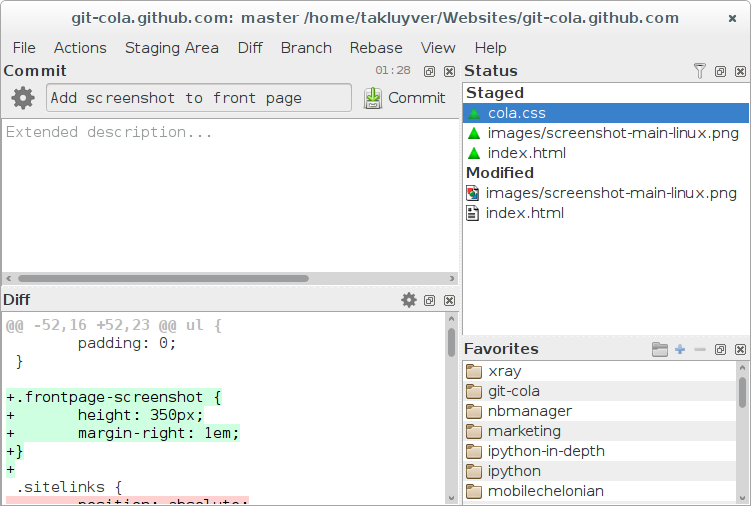 It is Node.js based and runs a server that users can view on the browser, so it is cross platform. Not sure if it manages SSH for users, but it is definitely something that I can see them doing. Not the answer you're looking for? 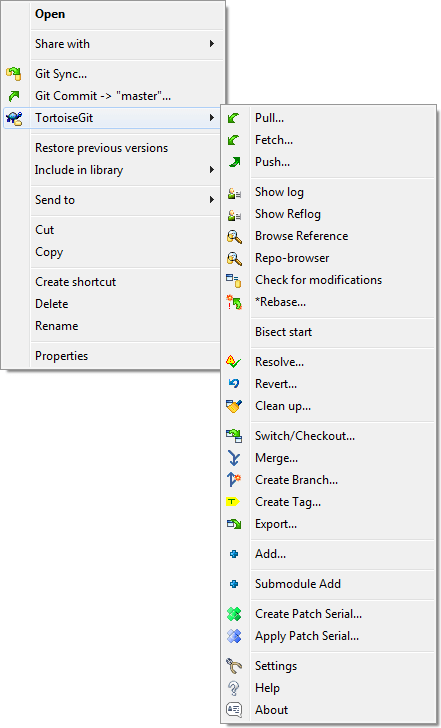 Browse other questions tagged windows git version-control or ask your own question. 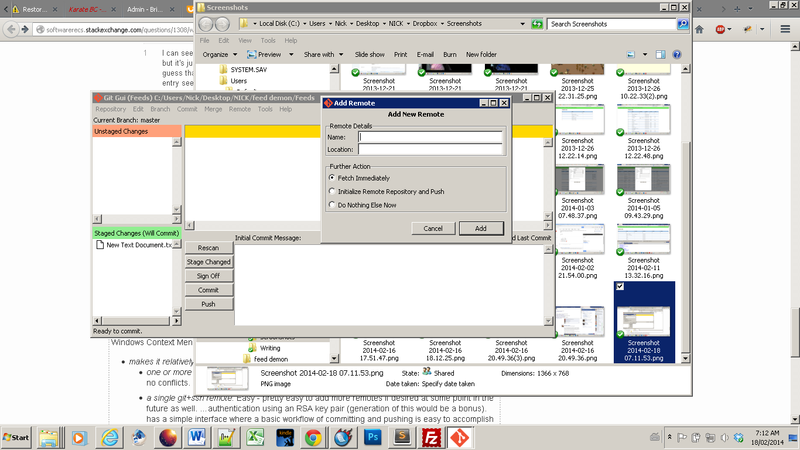 What is a good newbie friendly graphical Git client for OS X?